Have you made some recent changes to the URL on your site? If so, you can easily update them with the latest feature in Google webmasters tool. The Fetch as Googlebot offers a better way to submit updated URL’s for indexing in Google. Underneath the list of tools, there is a link “Fetch as Googlebot” wherein you can enter a URL for your website, leaving off the domain name and click the “Fetch” button. Once the “Fetch” status gets successful, you can submit that page to the Google index by clicking “Submit to Index” button. Go to Google Webmaster Tools and Login to your account. From the Google Webmaster Tools home screen, select the domain name, expand the Crawl menu and then click Fetch as Google link. Once you see that the “Fetch Status” is successful, you can easily submit that page for indexing. Click on “Submit to Index” button for the further process. Select “Crawl only this URL” if your page has been recently updated. On choosing this, Google guarantees to index only the URL of that specific page. Select “Crawl this URL and its direct links” if your site has been updated significantly. By submitting the URL itself, you get limited to 50 URL submissions per week and if your submit URL’s with all pages linked, then the limit goes to 10 submissions per month. Click OK. Now you will see a message that this URL has been linked and pages submitted to get indexed. This completes the submission process. 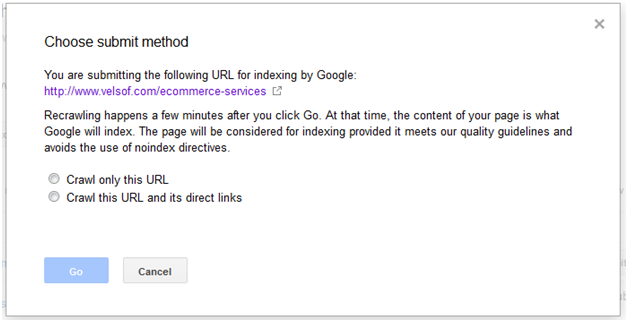 The yellow highlighted URL will be disallowed by Googlebot to index and store in Google’s directory. Adding the “Fetch as Google tool” feature will give a new rise to your marketing efforts by allowing your page to get displayed in front of Google searches in a much faster way. If you want to achieve the search engine rankings you dream of, then prepare yourself to fetch your web page every time you get your website updated.